Note: Measurements given for scarf after blocking. This scarf is knit in two halves, beginning with a provisional cast on. S2KP: Slip next 2 sts together, knitwise, as if to work a k2tog. Knit next st through back loop, then pass both slipped sts over st just knit. This forms a centered double decrease. 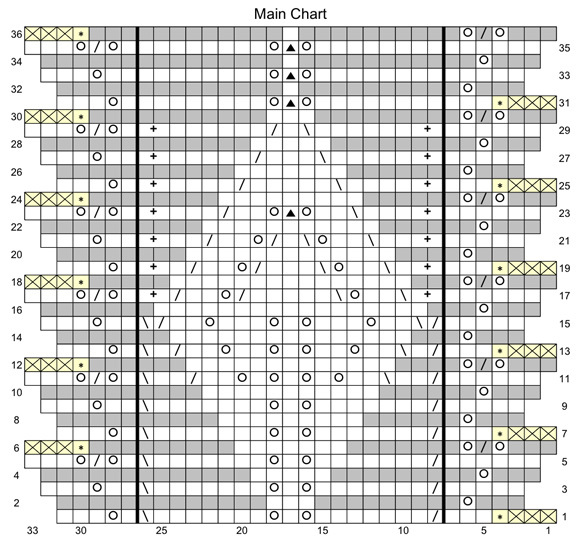 The charts for this pattern are very large. Each fits on a letter-sized page. Using provisional cast on method, CO 27 sts. 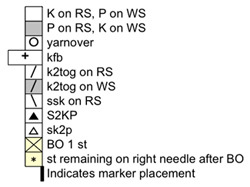 Set-up Row [RS]: K4, place marker, k2tog, k7, yo, k1, yo, k7, ssk, place marker, k1, yo, k3. 28 sts. Note: Stitch markers divide edging sts from main lace pattern sts, and are used only to help keep track of pattern. They may be omitted if desired. *Work Rows 2-36 of Main Chart once, then work Rows 1-36 four times. 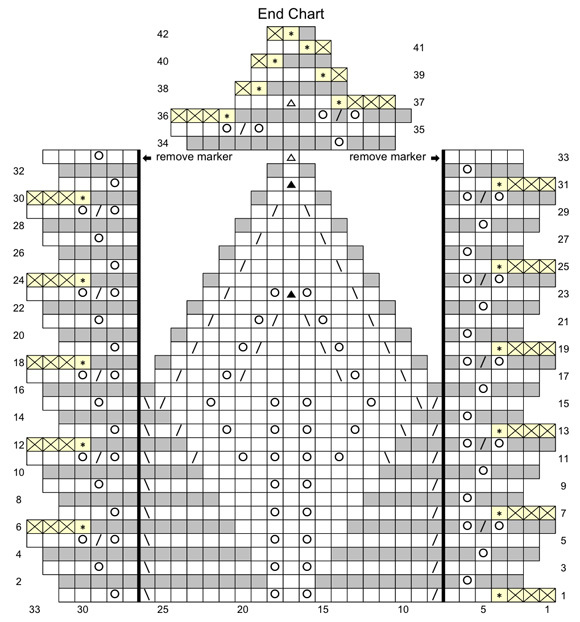 Work Rows 1-42 of End chart, removing markers as indicated when working Row 33. 2 sts remain when all rows are complete. Carefully remove waste yarn from CO edge and place resulting 27 live sts on needle. Join yarn with RS facing. Set-up Row [RS]: K4, place marker, k2tog, k7, yo, k1, yo, k7, ssk, place marker, k1, yo, k1, kfb. 28 sts. Work as for first half from * to *. Weave in ends and block as desired. 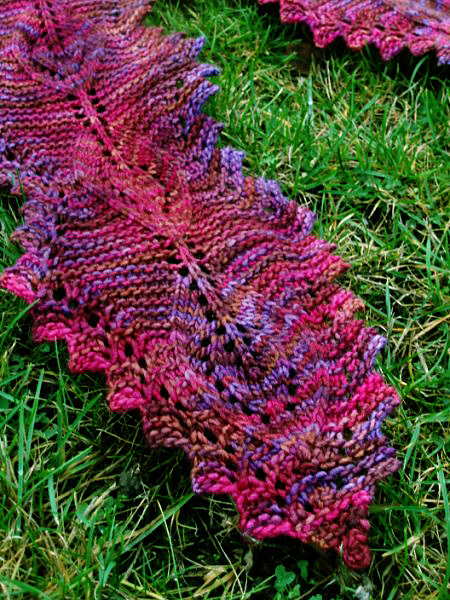 See Pattern Notes for links to articles on blocking lace.